To master the skill of playing the Blackjack, every fresher in the sphere of gambling should inquire on the most exquisite hints or tips of playing this game. The matter is that the Blackjack is the mathematic game, and there is no place for guesses or intuition in this game. The most essential is to leave the superstitions behind and rely on the mathematical strategies. Insurance is considered to be simply a kind of the side bet to predict whether the dealer has a blackjack having only one card opened. When a player is experienced, insurance bet may be useful in some situations but still it is advised not to make this kind of bet. For that, it is advisable not to seat at a table with the bet size exceeding 1/10 of the player's bank for the session. In a case if the player is an advantage player, the risks can be reduced to the minimum. The same principles may be used in the other best online gambling games. Some players resort to tipping the dealer by means of being nice and polite. The dealers usually work for a small wages and are open to the player's generosity. Besides, the friendly dealers make the game more enjoyable and easygoing. 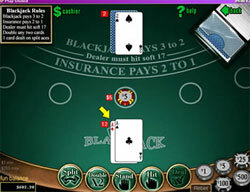 By means of tipping him, the player may make sure that the dealer still has the player's favor. This player's choice may double the bet and receive the additional card. It is possible to do if the player suspects that he may beat the dealer. This is considered to be the main advantage of the player. Splitting is possible when the player is dealt the cards of the same value. The player may double the bet, after he splits his cards, and play two hands. It is not advisable to split 5's or 10's. Usually 7's and 8's are split against the card of the dealer of lower or the same value. It is important to know when to hit and when to stand. It is possible for the player to hit hard until he reaches 17 or even more. It is advisable to hit soft 18 in the case if the dealer owns 10. Variation of the player's betting amounts is the key to the success. The player may vary according to the results, increase them in the case of winning and decrease them in the case of losing. It is called the common sense that is forgotten as a rule during the jeopardy of the game.